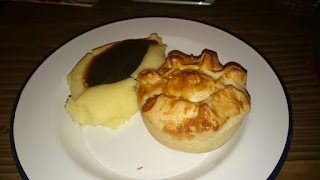 Pierate - Pie Reviews: Are Putney Pies REALLY the finest in the land? 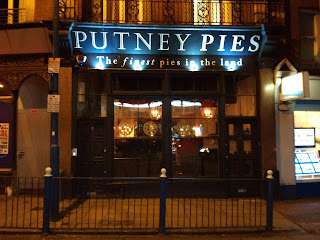 Are Putney Pies REALLY the finest in the land? 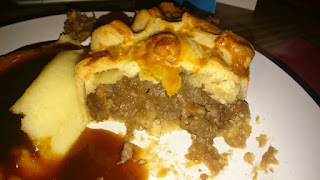 Since we started reviewing pies many years ago, one of our most popular articles has been our best pies in London page. You might think that it would be fairly easy to keep this one up to date. We already have a thorough list - so all we need to do is review any new places that spring up? But with London being classified as a "Mega City" it has proven anything but easy. In the time it takes to mop up the gravy from one pie the hipsters are already raving about a new pop up shop where they only serve indigo food and you must use chop sticks BUT they do a plum pie which is TO DIE FOR!!! Or there are the places a little outside the city centre and it's just a bit difficult to find your way over there especially to try a pie. Sure, we might come across as single-minded pie-obsessed maniacs but sadly there are other things we have to worry about in our lives such as work, sleep, our deadly pollution levels and regular dental check ups. (Okay, maybe they aren't that regular...) All of these things sadly eat in to our pie reviewing schedule. Combine that with the fact that only Pierateer Tim actually lives in London and you might understand why it took us so long to visit Putney Pies. Their slogan promises that they deliver "the finest pies in the land" and given that they specialise in pies it seemed a must for the Pierateers to check them out! Putney Pies - self labelled "the finest pies in the land"
When we were recently looking for somewhere to get a special pie to celebrate Pierateer SJL's birthday it seemed like a good enough occasion to trek over to Putney and they have also recently opened "The Vault". This is underneath their main restaurant and is built into one of the arches of Putney Bridge itself. It seemed like it might provide the unique pie setting we were looking for. Certainly the atmosphere inside was special and we all enjoyed it! You sit within the brick arch and it feels like some kind of bunker where you could take refuge from nuclear war and the only food to eat for the rest of time is pie. Sam was in two minds about how he would feel about that one... but anyway, this is a great setting for pie. It remains classy; some pie related decor but they forgo the in your face kitch pie paraphernalia that other places resort to. At weekend evenings the music turns up and you can imagine it is a great party venue with people getting off their faces on pie! 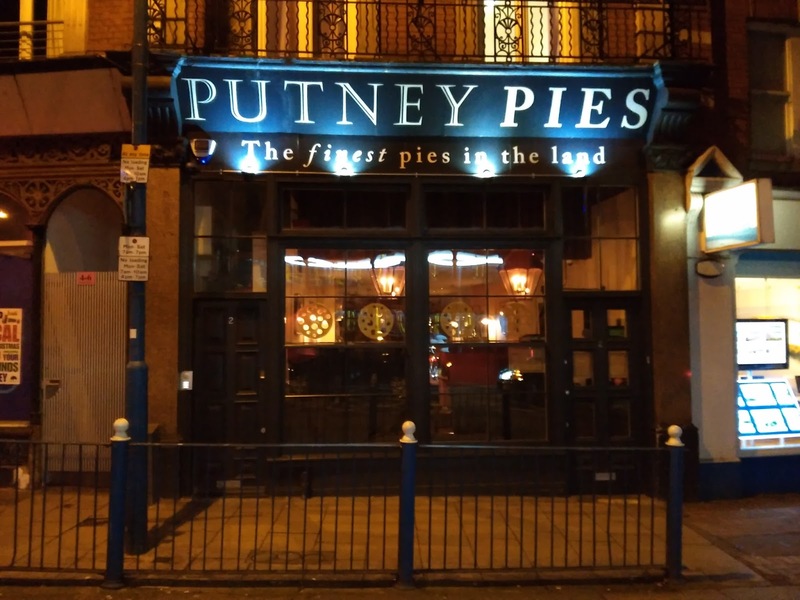 It was good to see a choice of 7 Proper Pies which is well above average for a restaurant but expected for somewhere such as Putney which is specialising in pies. They do also offer a range of 'pot pies' or 'casseroles with pastry lids' as we might call them. We were please they used the slightly inferior 'pot pie' term for these pies but puzzled as to why they don't offer the choice of pastry case with all flavours as other places do. Pierateer Sam ordered a classic, the Steak and Ale for £10.95 (now £11.95) with mash and gravy which is pretty average for a London pie in this kind of setting. 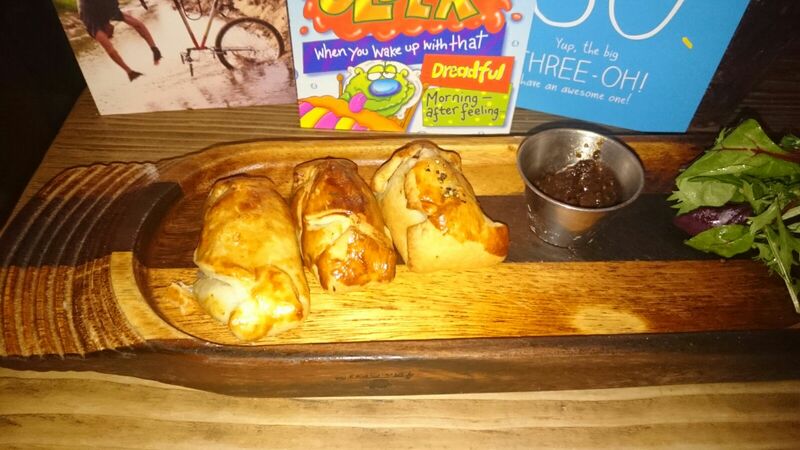 He also got the 'pie bites' starter which was 3 mini pies for £5.95. Pierateer Rob got a Beef Bourguignon and they could also cater for Pierateer Anna Senior (veggie) and Pierateer Anna Junior (gluten free). However this did mean a top-crust, spicy butter bean pie and a shepherds pie respectively. Pie Bites, but are they pies? Sam continues: "Now onto the meat of this review and when I say meat that was the star of this pie show. It was well filled with proper pieces of flavoursome steak. 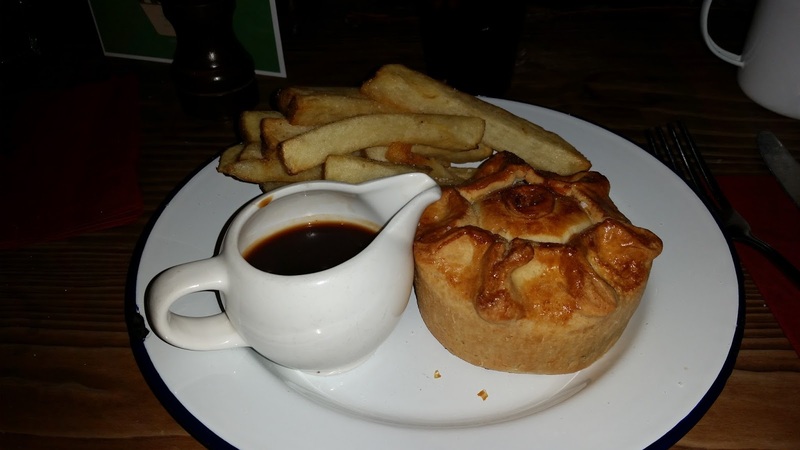 They sat in a tasty gravy made with London Pride ale which was just the right consistency. 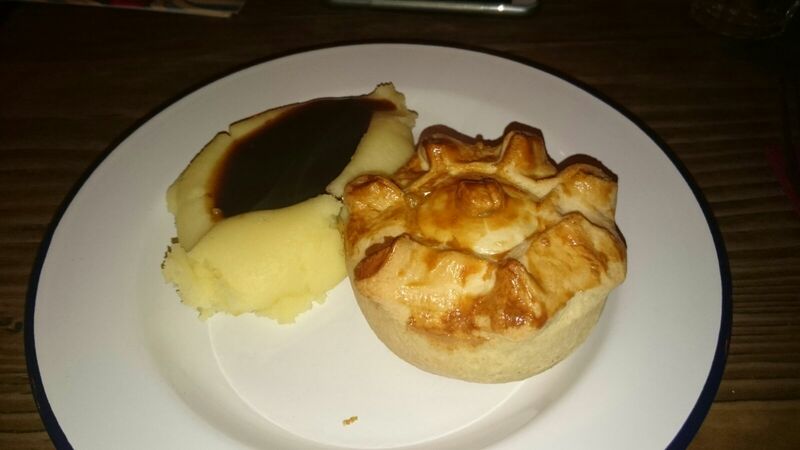 This was a decent sized pie, well filled with chunks of meat which felt like decent value at this price. The pie also looked fantastic, reminiscent of the recently defunct Paul's Pies and it was nice to see them put the effort in to make it look good. It had a lovely glaze on top but this was a bit patchy. 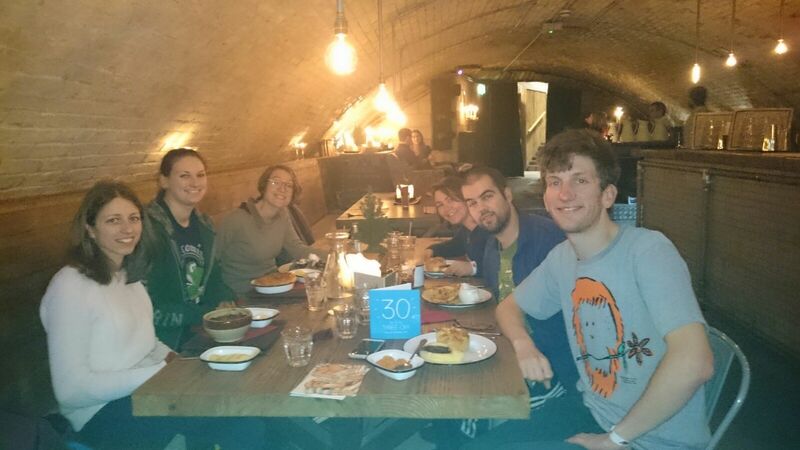 Pierateer Rob went for the Beef Bourguignon pie - also £10.95 at time of purchase - and had this to say: "The setting was great - never been in an underground vault like that before, let alone to eat pie there! I was excited to see the range of pies on the menu, even if a lot of them turned out to be casseroles with a pastry lid or even potato bakes!!! But there was still a decent selection of fully encased in pastry pies to choose from. The Beef in the Beef Bourguignon pie was quite nice, not too chewy and had a good flavour to it. Upon starting the pie I enjoyed the taste, with the filling nicely complementing the pastry. However after a while it was clear the pastry:filling ratio wasn't quite right, especially with quite a dry and crumbly pastry (as Sam has already pointed out). In the end there was some leftover pastry as it just wasn't quite nice enough to eat on its own. But the filling was better than in Sam's pie, and I would happily eat another one if offered, so it sneaks a low Pierate Recommended from me." Matt Barr, the owner of Putney Pies was good enough to come and talk to us. He has big plans to take up more space in adjoining arches in order to produce more pies which can be sold around London. His business plans sound enticing and we really wish him well. With some tweaks these could be great pies. We think part of the problem may be that Phil doesn't really like pies himself. 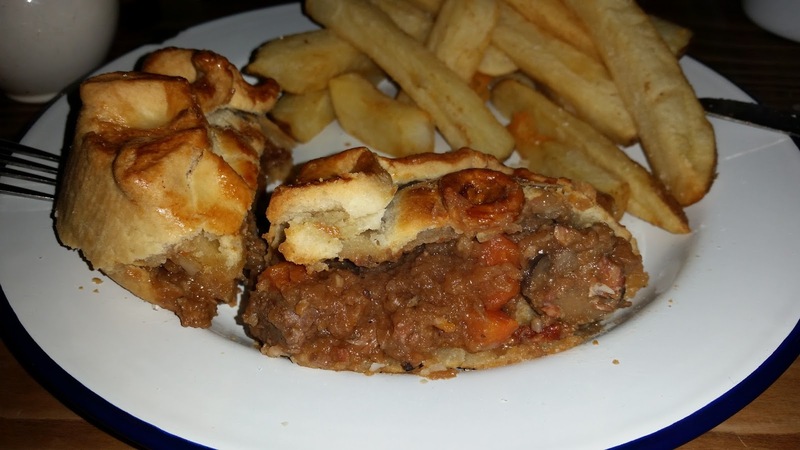 Most of the really great pie places have a chef or owner who is fanatical about pies. And we mean fanatical!! !Whilst he is mainly focusing on the business side, we are sure Scotsman Phil can be successful with the right people around him. We wish him all the best in the future! Wedding Pie? Don't mind if "I do!" I real-ly can't fault these pie much!